Lord have mercy, Day 2 in Moab would prove to be a body buster. If you’ve been to Moab, you’ll know that you don’t have to ride very long distances to put some hurt on your body. Day 2 found us riding a relatively short distance, but on some of the gnarlier stuff that Moab had to offer. The day was going to be John T, Brian, and myself. In a group of 2 or 3, you can really knock out some rides. Brian was only in town for a short time, so he was looking to get some riding in. I can’t blame him. 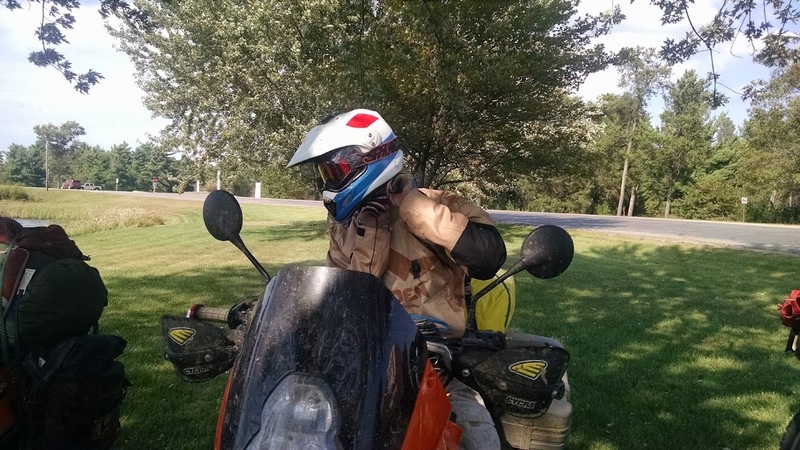 When you drive 1300+ miles to a location to ride, you want to ride…..and ride….and ride. So that is what we would do. What to do first though? First up was decided that we would ride a section none of us had ridden before. Close by, and some of the reviews said “if wet…..don’t attempt”. Silly jeepers can’t handle rocks apparently. We decided as well that we would ride Steelbender North to South, so that we’d be closer to more riding after the section was done. From what I recall of the beginning, the trail was a good mix of sand, and rocks. Some moderate obstacles were in along the way, but nothing that was unmanageable. This section of the ride, it was early, I was mildly tired, and thus resulted in me taking minimal pictures. Somewhere along the way of Steelbender, Brian offered up his 500 to me. I was intrigued to try his bike for a couple reasons. One was that I wanted to see what I was missing with having the 350 instead of the 500. Two, Brian had some fancy re-valved forks on the bike. I want to say Pro-Action 3 way valving, but I may be wrong here. Three, Brian runs a steering damping (Scotts) and I run nothing on my 350. Anyways….I was glad I got to see the difference. Bike testing aside, once back on the 350, I felt back at home, though down on power. I missed that, and realized that if I had to have 1 machine, that the 500 would for sure be it. We meandered along the trail, enjoying some nice overcast sky. That last pic is a bit of a lie. Yeah, just about everything in Moab is 2-track, since its all Jeep created (motorcycle specific areas excluded). What you just don’t get is how you go from a flowing sandy 2 track section, to knee high rock boulders in the middle of the trail, requiring instant clutch work with a healthy dose of body english to not go bashing your rims like a bowling ball into rock ledges. As we worked our way to the end of Steelbender, it was apparent why going the opposite direction of us would have been a PITA. There’s one bad hill climb, that if wet, would be nearly impassible. At the end of the trail is a nice creek crossing, which had some depth to it due to recent rains. We had a small crowd (2 ladies walking their dogs), so we all did our best to not drown any bikes. Success was had, with us working our way West out of the area to intersect with 191 and decide our next course of action. We saw we were close to Behind The Rocks, and I secretly saw that it connected with the back entrance to Pritchett Canyon, so I was all for doing this. The pic above shows what is the first obstacle to get into Behind the Rocks. After Brian and myself worked our way up Guardian Hill….we pulled out the lawnchairs and watch John. This climb is one of those commit, and line selection. The added difficulty being that at the top, it’s all sand, which gets really kills your grip along the way. If you have a hard time with balancing….this one could prove difficult. Then how can you NOT like stuff like this? As soon as I got down, I saw John & Brian scouting a much different route….one that appeared to have less ledges\etc. At this point, we weren’t far from the end of Behind The Rocks, and were seeing the sign for Pritchett Canyon. It was decided we’d better eat a snack before heading on, as we’d been told that Pritchett Canyon is one of the hardest trails in the Moab area. 2 Were comfy in these, 3 would have been a bit of a crowd, but doable. With that, we drove into town, got groceries and let everything settle down. We had no fridge in the little cabin, so we made do with keeping a foam cooler full of ice. PB&J, Ham n Cheese, and some Ramen was all that was needed to fuel us. OK, probably more would have been better. Don’t worry, we ate out a few times. Some better than others. Food didn’t really matter at this point, our goal was to figure out the next days riding. 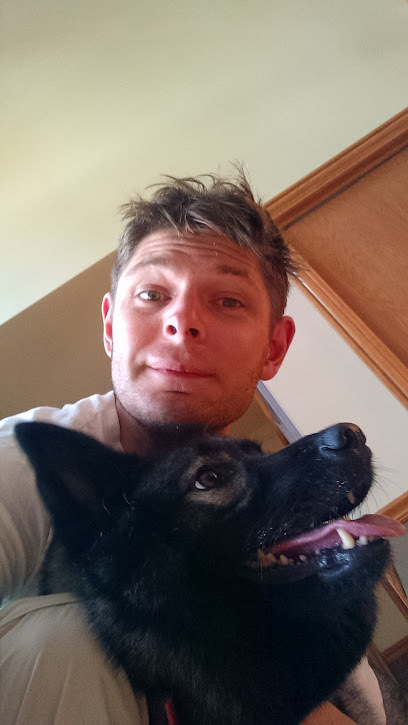 John & I were planning to meetup with a guy Brian who we’d ridden with in Moab last year. We were thinking of riding a trail called Fins n Things, since it was close by and figured it’d give us a chance to make sure the bikes were in good working order before venturing further off. Saturday morning the plans veered slightly with John and myself meeting with Brian, Doc, Lacy, and Kenbob who were thinking they’d go off to ride Lockhart Basin. We’d ridden that twice last year, but it is a good rather mellow trail. It’s an out n back kind of thing which has you doing around 120 miles by the days end. Maybe more if you stop at the gas\restaurant out in Needles park. Lockhart Basin starts with you going through town, and follow a nice twisty paved section of road to get to the start of gravel\off-road. Not even 5 miles into the ride, Kenbob is stopped on the side of the road with his Husky (italian) with the bike not starting. We were stopped right along the Colorado river, in the shade, with beautiful canyon walls all around us. Great for sight seeing…not so great for what turned out to be Kenbobs in tank fuel line burst. Lacy decided he’d stay with Kenbob, pickup their truck and rescue him. Doc on his KTM 300, Brian on his 500, John and I on our 350’s decided we’d continue with the days ride. The ride as said above, a great way to get in the groove of Moab things. You go from road, to gravel, to 2 track, to rocks, and then mix that all up along the way with a dash of sand here and there. There’s also a few good views tossed in along the way as well. Yah, you gotta stop and take a few pics along the way. While riding, you have to balance between focusing on riding, and enjoying the incredible views. From here, we worked our way along the trail. About 10 miles from the Needles Outpost, there was a creek crossing, which was followed by about 10 miles of open gravel road. We took a poll and decided we were all cool with turning back there, and making out way towards home. I asked Doc how he was on fuel. He was rocking a KTM 2T, and while he had a larger than OEM tank, I know those 2T’s like fuel. He informed us he was running a Lectron carb now, and while he hadn’t actually tested range, he claimed better than stock MPG. You can guess where this is going, but we told him your call, and began making our way back. As noted, the views here are “above average” to say the least, and leave you scratching your head at how in the hell does this happen. Yah, I had to get a nice panoramic of the 350 on a more open section towards the end. You could really get to enjoy some of these fast and open flowy sections. The 350 has somewhat short legs, but it’s nice to stretch out into 6th gear for a few, and feel a good breeze against you. Even with the temps being relatively cooler, it’s easy to warm up quickly, especially with all the gear you pile on. All good things must come to an end, and 90 miles into the ride Doc was clear out of fuel. We had at least 20-30 miles to get back to town. I noted the excess fuel in my tank. 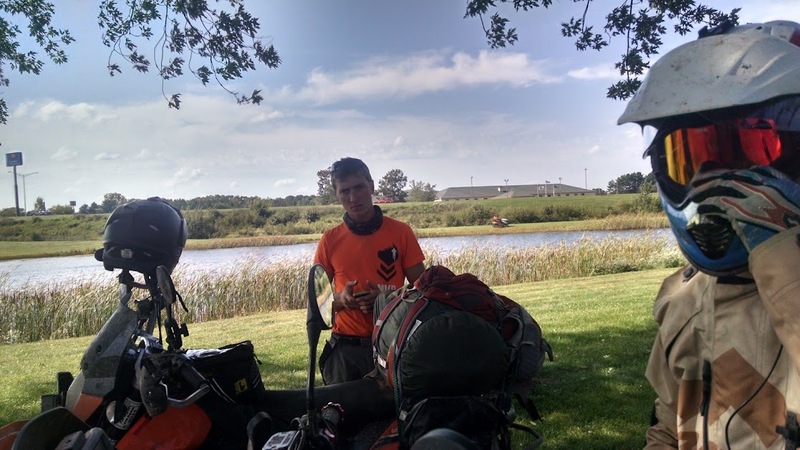 Brian happened to have a couple empty water bottles in his pack as well as a small section of fuel hose. I offer up my fuel, and somehow find myself siphoning fuel for Doc. A mouth full of fuel later, and I managed to get around 1L of fuel for Doc. Again, he claimed this was enough, I was happy to be done ingesting gasoline, and buttoned everything back up to continue on back. I know when you’re low on fuel, you can sometimes ride amazingly conservatively, resulting in phenomenal fuel mileage. That didn’t happen. Sure enough, 3 miles or so from town Doc runs out again. I decide this is BS and since I spent the last 20 minutes spitting out the taste of gasoline from my mouth, tell him we’ll use my tow strap for the remaining bit. I drop him off at the closest and fill up my tank. 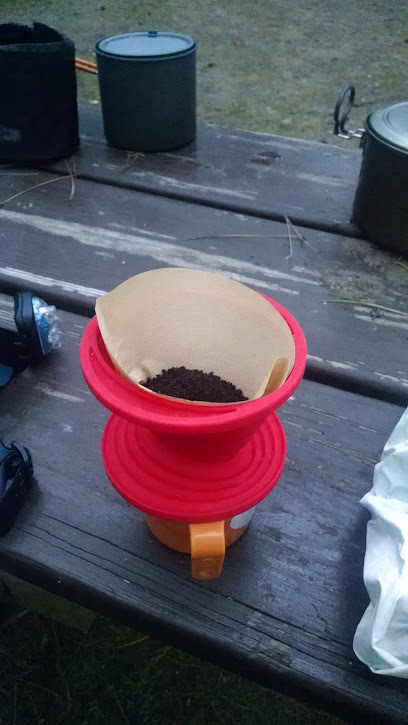 We got back to camp, and I opened up a refreshing beverage and began taking some notes from the day. I knew if I didn’t take notes then…it’d never happen and I’d forget everything that went down. John & I would meet a group of guys in town, at a crappy Mexican restaurant. It was so forgettable that I didn’t take any pictures and have blocked the guacamole out of my memory. I slept well that night. Good dry air and a tired body will do that for you. Todays ride was a good warmup….tomorrow’s would be a body beater. As with last year, a trip to Moab, Utah was planned for early\mid Spring. This year however is absolutely terrible timing. Two days after I’m set to come back from the trip, I’ve got a trade show with my shop. I find out that we’ve also hired a sales & marketing intern, so this adds in the prep work needed for the trip. Oh yah……I’m also a couple months in on building a new house. I’m not swinging the hammers, but I still have the feeling of “I should just stay home”. Yet, I’m living in a basement, with my moto crap on borrowed space as well in my parents basement, so stick with the plan and get in some bucket list rides I missed last year. The plan was to leave Thursday April 28th and get home Saturday May 7th. Factor in 24 hours of driving, which gives us roughly 7 days of riding, or something like that. Still fuzzy and all that. Last year there were 3 of us driving out together, meeting up with some guys from a local Meetup group. This year was just myself and John T, who I’m sure I pissed off plenty before the trip with my himhawing about saving pennies for the house, my current work load, and my consideration of selling my KTM 350, to which he kindly referred to as”the most fking incredible bike ever”. Other than that, our riding plans were “get there and ride”. I had some ulterior motives and longed to do 5 Miles of Hell, and the Kokopelli Trail with visiting Top of The World along the way. Aside from that, the plan was to ride a lot and get home with bodies & bikes in the same condition as when they left. All loaded up, we got out the door @ 5:32pm CST. Next stop….Moab! 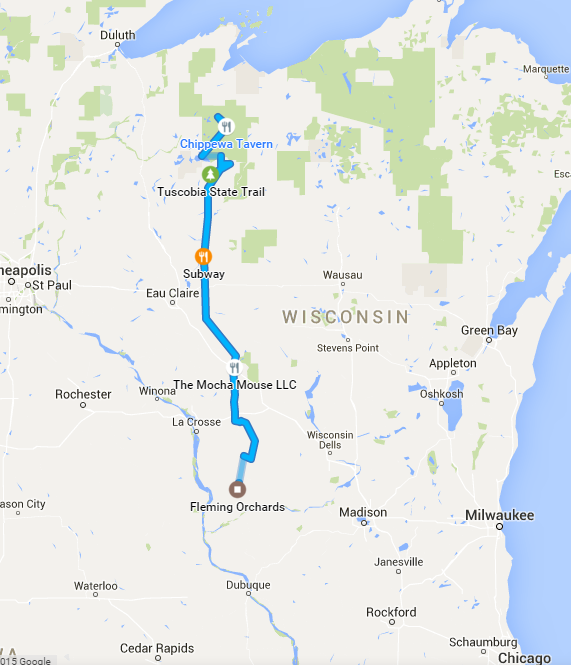 Day 5 (Thursday) – Gays Mills, WI back home. All good things must come to an end. My forks (which had been leaking since day 1) would thank me. I woke up plenty relaxed after a relaxing evening. I had all day to get the 180 miles (taking highway) home. I was in no rush, and for the first time on the trip, I was flying solo. 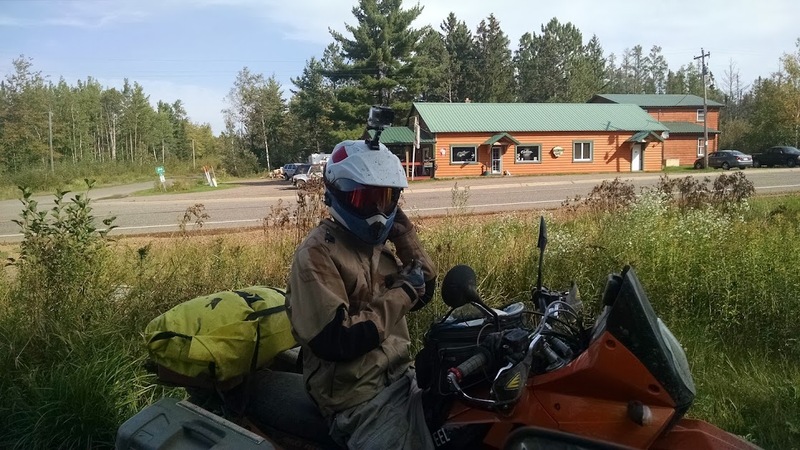 Caleb had his 690 loaded on his trailer, Jameson was off in Minneapolis and on his way to ride some more at Black River Falls. I had a general idea of how I wanted to get home. 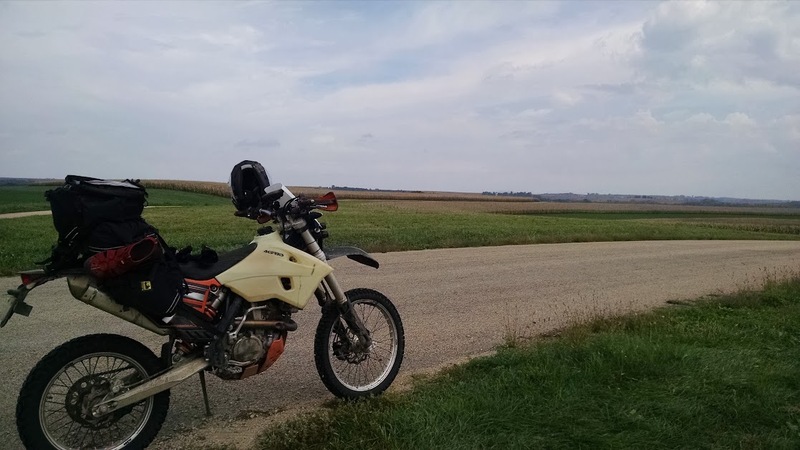 I wanted to just work my way west, and around Janesville area, work my way to State Line Road, follow that home, and end up in one piece, with no issues. I snapped a couple quick pics before I left my parents. The sky was overcast, I was stocked up with random snacks in my tanktail bag, and I was excited to be back on the familiar Seat Concepts seat. 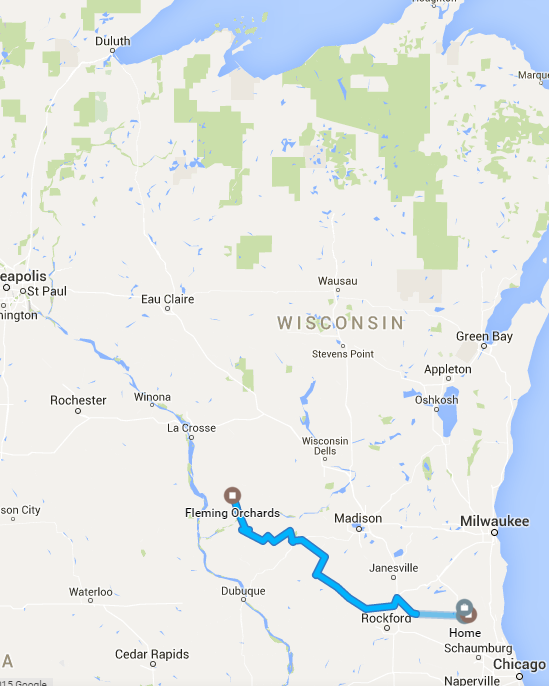 I decided to ride South on 61 until I got into Boscobel (South of the Wisconsin River). Normally when driving out this way, I stay North of the River. I figured I’d switch things up a bit. What a great decision. As soon as I began exiting out of Boscobel I saw what looked like the perfect off-shoot to take. I found myself winding through old farm lands, weaving into darkly lit tunnels of trees with a fresh feeling of early Fall in the air. No sooner was I enjoying the ride, when the sky opened and began a light rain on me. I didn’t care. It was part of what I was riding, and with the time I’d spent on my bike in the past few days, every move I made, I felt one with the machine. No concerns that I was riding over wet leave strewn roads. I was in my element, a very happy place. This twisting and winding went on for a good hour and a half. Look over there, yah that road seems good, let’s take that. 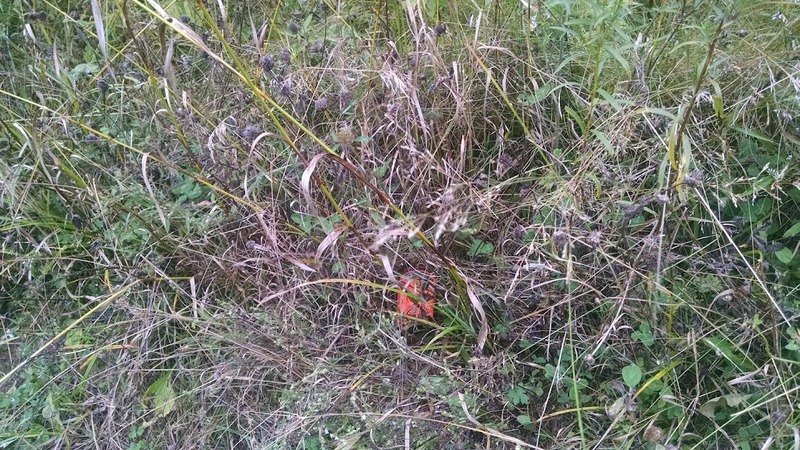 Where does this one go…..OK, let’s find out. So I continued on attempting to somehow delay the inevitable of more open corn\farm fields and the reality of getting back home. That was OK though, as I was feeling accomplished. Thinking in my head, just a few days prior, I had just started to ride out this way, pondering……will this little 350 single do this? This high strung race bike, how far away am I going to be when something on it pops. Who’s gonna take one for the team and drive my truck way out here to pick me up. It never happened. 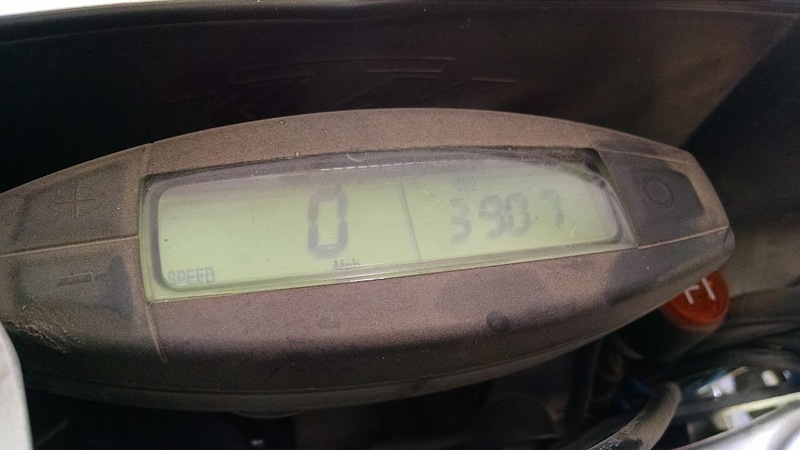 My bike without a hiccup was doing everything (and more) that I asked of it. The rains eventually began to subside, which gave me time to stop and enjoy an early lunch snack. I ended up only stopping another time or two on the remainder of the trip home. My bike at some point needed fuel and I needed another round of gas station food (pop tarts and nutbars). I really found myself enjoying the scenery. Yes, it’s open corn lands, but there just seems to be a calm in it. Nobody around, just the delicate wind to keep you company. With that, I found my way home. My wife was at work, so I was greeted by my pup. You can see my eye was still bugging me from the mosquito incident early on in the trip. Left at 11:30am Sunday, and was back home by Thursday 2pm. Right around 4 days of actual riding time. Awesome. For me, I could have continued riding this stuff for the next several weeks. I’m sure anyone else would say the same. I had been wanting to do a trip for awhile where I ended up in a new location each night. There is something exciting about not knowing exactly where you’re going to sleep. What you’ll do for food, what kind of fun you’ll run into as you cruise down the road. I knew going into this ride that the little 350 was far from an ideal machine. I didn’t care. If it blew up, I’d deal with it. It wasn’t the most comfortable of bikes, but is motorcycling ever about being comfortable? For me, it’s not. There is something about being open and vulnerable to the elements and being that much closer to your surroundings. All that said, for a ride like this, I’d love a bike with a bit more giddyup. Had I of been able to cruise more comfortably over 60-65mph, you could really cover ground a bit quicker. It’s ok. I wouldn’t hesitate to take the 350 on this trip again, and would gladly hop on it tomorrow to go ride the same thing again. 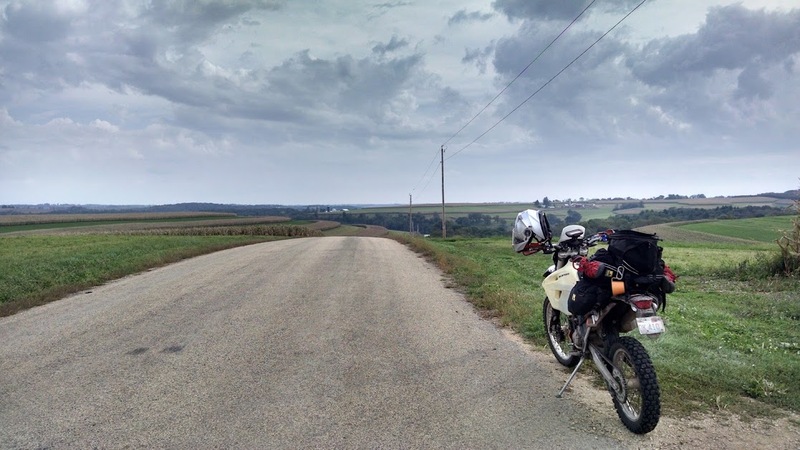 This is a ride that anyone in the Midwest area should add to their list of rides to do. There is nothing inherently technical with it. If you’re not a fan of sand, there really isn’t all that much of it. 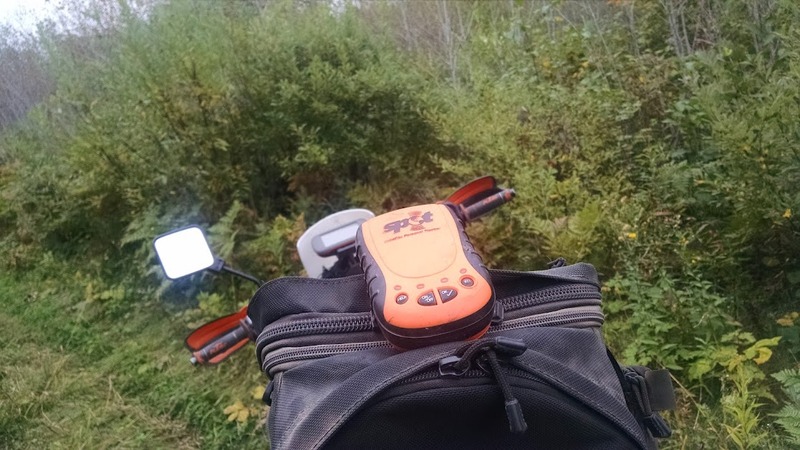 There are some ATV trails, but if you keep your pace reasonable, they’re nothing to be concerned about. One thing that I found after this trip was that my ability to drift my bike went through the roof. 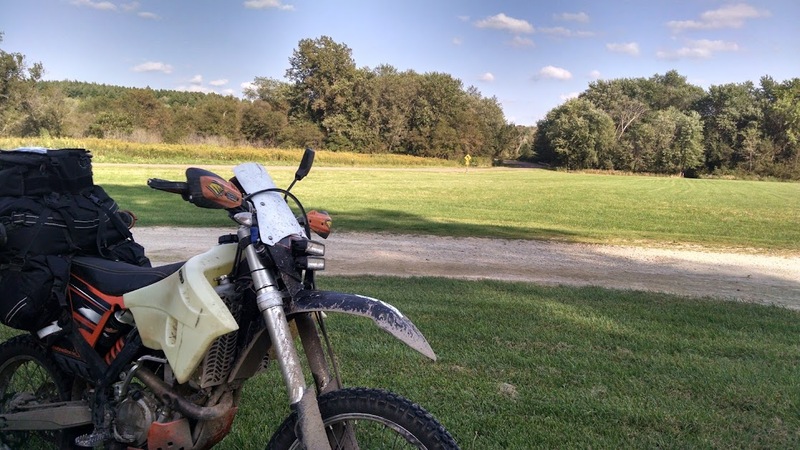 I’m not sure if it was the hours of fun on gravel roads with (in my eyes) glorified street tires, but I rode an Egg Hunt race not long after on the 350 (albeit with knobbies) and was so confident in riding with both front and rear wheel sliding out on me. I couldn’t have been happier. Post ride, my only real complaint was with my Garmin Montana. 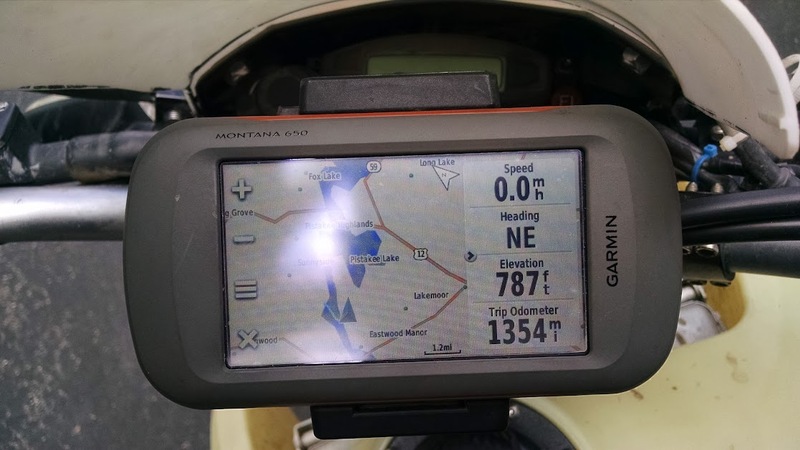 I don’t know actual times\mileages, because as soon as I hooked my GPS to my computer, it freaked out and I lost all my data. Kinda crappy to happen after the units first use. Garmin stepped up and sent me a new unit, so all is well…just no data. And so it ends. I’m looking forward to spending some time this next year scrambling around the Driftless area. I foresee several more trips to the area. That much is true. 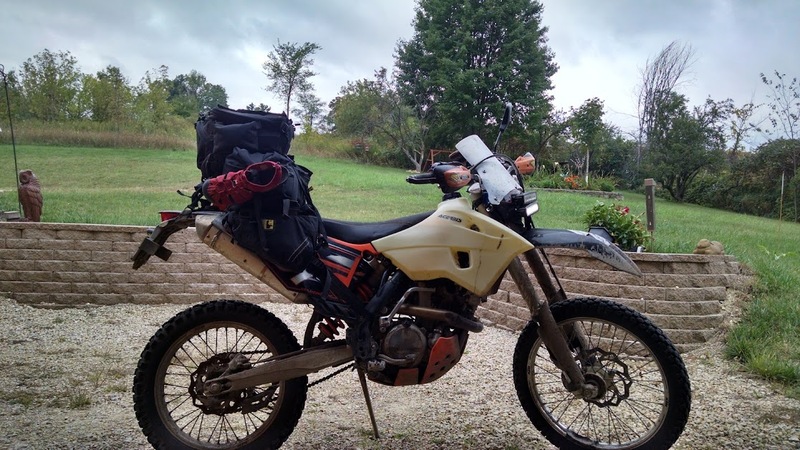 Day 4 for me, would be a day of hunker down and get cozy on that there KTM saddle. I’ll explain later, so let’s start at the beginning. From here, we discussed the days plans. I was confident I had the location of my SPOT sorted, so I decided I’d packup quickly, find the SPOT, and meet at the local gas station. If I didn’t find it, I didn’t find it. If I did….rad. According to Google Maps, the unit was in a small clearing on this side trail we were on. Sure enough, that silly thing was exactly where the internets told me it would be. I can’t recall if it was after or during this RR 111 section that we got to ride some more ATV Trails. 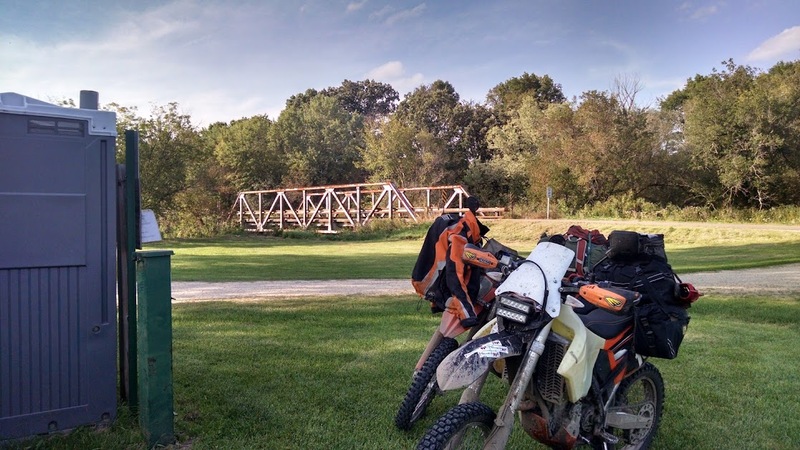 Wherever it was, Caleb informed us that that was the section that they had rode……..at night……with the trail completely flooded. When we rode the ATV sections, there were some soft spots, but absolutely nothing worrying. Ride the side, and you’re through. Caleb explained that when they rode the year prior, there were football field length sections under water, where they hoped they wouldn’t sink. Now that’s adventure. :lol3. Just before we were to hop on the road, in a quick turn-around, Jameson found himself in the dirt. We’re going how far on the road from here???? We blasted straight South on 70. Yes, we blasted about 130 miles straight highway. Now that isn’t that far or that long. It just slightly more a PITA when you’re riding a bike that feels like its top cruising speed is 65mph. Yes, 70 started feeling more comfortable as I wanted to get done with it sooner, but 65 was where we needed to be. We stopped about half way in Cornell, WI. Grabbed some fuel & some snacks. At this point Jameson realized that the glass jar of jelly he had in his side pannier decided to open itself. Yes, a pannier full of strawberry jelly :lol3 Go figure that where we stopped, also happened to be home to a handful of wasps. I took pity and didn’t snap any pictures of Jameson during this scuffle. From Cornell, we decided to stop just outside of Black River Falls, at the Mocha Mouse. A small little coffee\whatever place. It was early afternoon and we had to decide what we were going to do for the rest of the day. We knew ride, but back to the cabin? Off-Road in BRF? We didn’t know. For me, it was becoming apparent enough as to what I needed to do. At this point, I knew I wanted to be home some time Thursday. I also knew that I was within striking distance of my parents cabin near Soldiers Grove. I could tell Jameson was itching for some more off-road riding. Caleb, seemed to be erring on the side of getting back to the cabin, to trailer home the next day. With a healthy dose of Caffeinated Mocha drink (and maybe a jumbo chocolate chip cookie), Caleb and I would say Farewell to Jameson. His plan however was to meet up with some friends…..in Minneapolis. Yes. 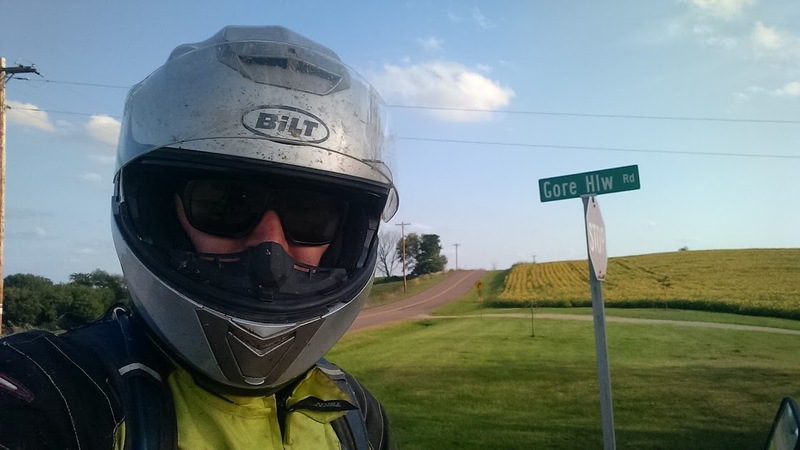 He ran from BRF back up to Minneapolis to visit some friends (and then back to BRF the next day to ride some more trails). We’ll see you later Jameson! We gotta ride how far now??? 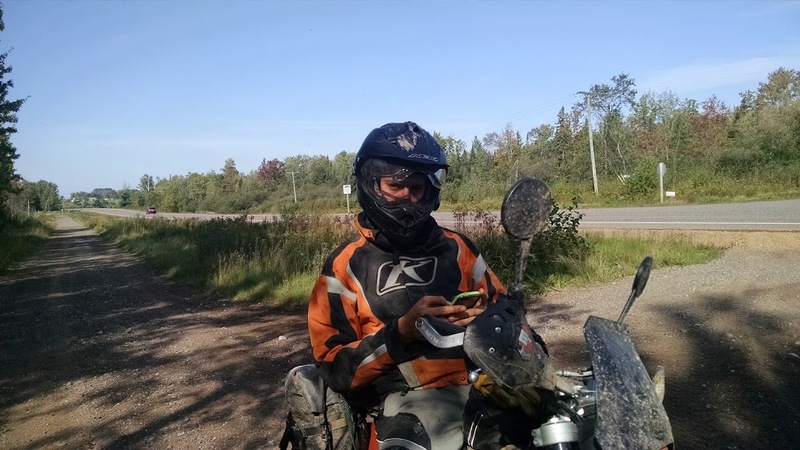 Caleb and I hopped on our trusty KTM’s, and worked our way down through Sparta and onto the Ontario area. Now this is where things got a bit…..interesting. I’ll tell the story as best I recall, but I could be off in my recollection, and for all I know, it didn’t even actually happen. We went to stop for fuel outside of Ontario, but I missed a turn. 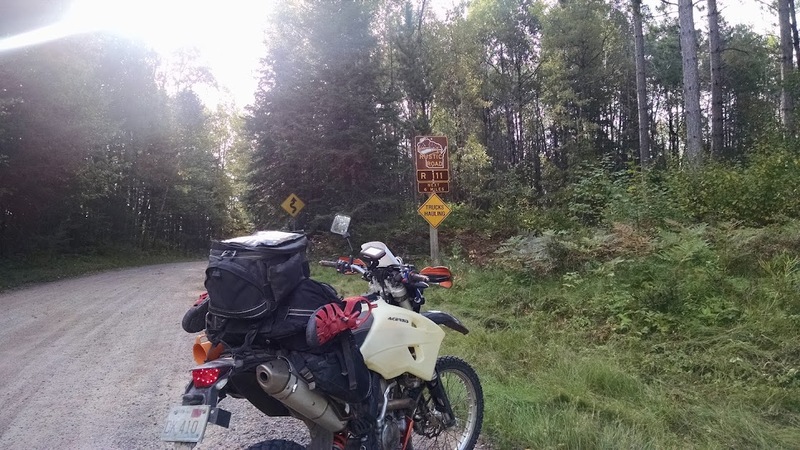 I figured we’d be fine on fuel, and saw that Ontario had a gas station of its own just outside of Wildcat Mountain (which we had ridden on the way North…and I wanted to ride again heading South). We roll up to this small gas station, and I see a younger guy on a street bike. Caleb stops at the pump across from the street bike guy. I pull up next to Caleb, since there were only like 3 pumps here. 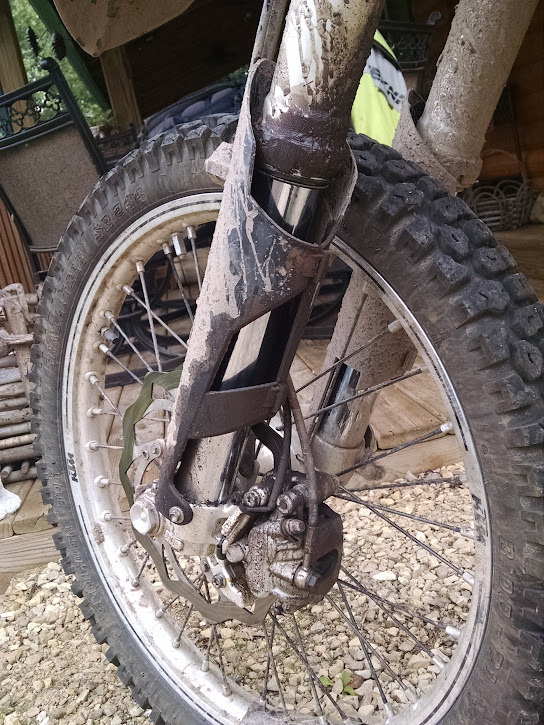 Caleb hops off his bike, and tells me….Hey, I gotta pull all this crap off my bike to fill up. For those that don’t know, a KTM 690 has underseat gas tank, with the fill spout kinda above the rear fender. In Calebs case, it requires him to remove all of his gear to get to. So, I roll up and fill up my gas tank. When I’m done, I roll my bike back and let Caleb in spot to fillup with fuel. I am checking some stuff on my GPS when sportbike guy rolls up. 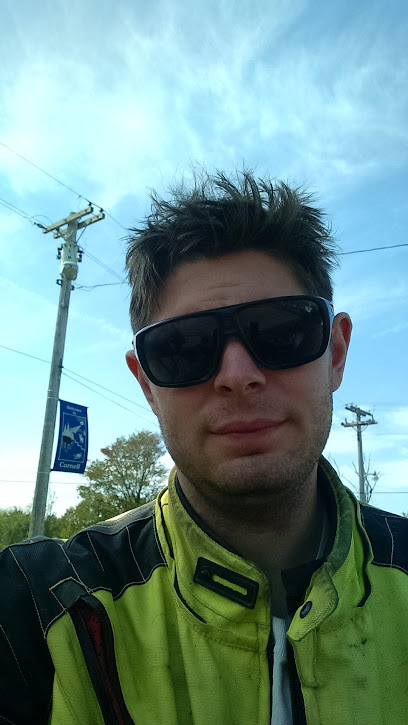 We start chatting, with him explaining he’s from around the Madison area, and loves the roads around here. We talked Wildcat Mountain a bit, and I explained where we were headed. He started to fill me in on some of his favorite roads in the vicinity, when all of a sudden some older gentleman gets up out of his car all worked up. Caleb at this point had literally just finished topping up with fuel and was beginning to strap his luggage back on his bike. This old guy starts coming at us, screaming to GTFO of the way of the premium pump. Caleb, sportbike guy, and myself all look at eachother like…what are you going on about? Old man starts yelling at Caleb to move his bike, and quit sitting around talking. I try to reason with the guy that he literally just finished fueling up, and we had no idea that this was the only premium fuel pump at the station. Trying to reason with a crazy person in and of itself is crazy, so I just tried to get the guy to calm down. Sir, we’ll move the bike, we didn’t mean to inconvenience you here. Now at this point, sportbike guy get a bit lippy with the man. On one hand, I can’t blame him. The old man could have been cool about it, but he came out a blazing hot-head. 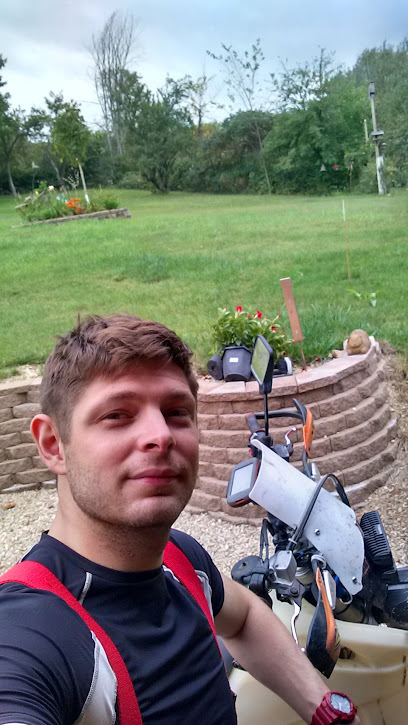 So here I am, standing next to my bike. Caleb is standing at about my 1 o’clock, a few steps away. Old man is to my 3 o’clock about a step away, and Sportbike guy is at my 9 o’clock. Sportbike guy begins making a few comments about the old mans car, at which point he pushes me out of the way to get at sportbike guy. These two kinda lock eyes, looking like I’m about to witness a brawl. Old man gives sportbike guy a big shove. I try to step in a bit and try to get the guy to calm down. Sir, Sir……Sir, just go back to your car. There is no need for this. We will move our bikes, we had no idea we were inconveniencing you today. Sportbike guy looks like he’s about to exchange fisticuffs with the man. After a few more of my reassuring pep talks, the old man slowly walked back to his car. Caleb and I roll our bikes away, and begin getting our gear on. As we’re gearing up, sportbike guy comes up to Caleb and I, and makes mention he’s gonna retaliate. Caleb and I look at each other, toss our gear on, and get out of dodge. We stop a bit up the road, and kinda run over to ourselves what just all went down. We both agree this was crazy. Where we stopped was close enough to still kind of see the gas station. At which point we kinda see the sportbike guy circle around old mans car, and then zoom off in the opposite direction. Caleb and I look at each other. I tell him if he sees a Mercedes in his mirrors, to just stay on the gas. We fire up our bikes and make our way through Wildcat Mountain……thankfully with no Crazed Old Man behind us. We moseyed on down the way, taking one of the roads suggested to us by sportbike guy. 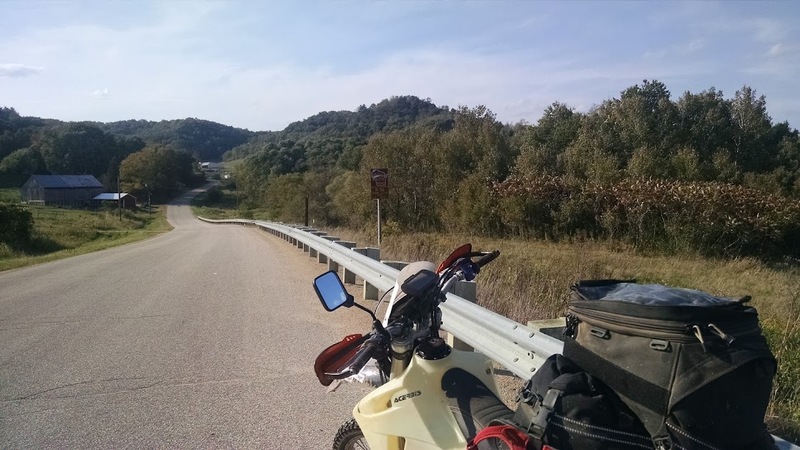 It was a great road, and had my bike of been faster…..even more fun. We stopped for a quick restroom break and enjoyed the peaceful area, away from anyone else. From here, we followed whatever way we felt like. I have to say, it was an incredible portion of the trip. We meandered through farm land, on winding paved roads, darting in and around spotted gravel sections. The 350 was in its element here. You could really ride the bike fast, without going illegal speeds. I carved like I was on a supermoto, and was able to still take in the scenery. Sooner or later, we were getting close to some locations I had ridden, and knew I needed to snap a quick pic where I had forgotten to when my wife and I had been riding nearby earlier this year. With that, we finished our ride back to my parents cabin. It was a long day, with a LOT of riding. A LOT of varied riding as well. It beat the prior days for excitement, that’s for sure. Very good, fun day. Caleb and I grabbed a frozen pizza and cooked it up, enjoying a few leftover beers from Sunday night.